Pregnancy is not the harbinger of joy in Sierra Leone. Instead, it brings distress, sufferings and death. When Hawa Kamara of Thompson Bay went into labour, her husband, Joseph Dumbuya, had to rush her to a hospital because of the complications that she had developed. Hawa had reposed faith in a traditional birth attendant for supervision during pregnancy. The attendant did not have the expertise to handle the complications. At the hospital, Joseph was heart-broken when doctors told him that he had lost both his wife and child. “The baby was in the wrong position and Kamara had lost a lot of blood,” the 34-year-old, who would have been a proud father the second time, was informed. Sierra Leone, which has the highest maternal mortality ratio (MMR) in the world, recognises bleeding as the leading cause of maternal deaths. Pregnancy-induced hypertension and sepsis follow closely, states the maiden report of the Maternal Death and Surveillance Response (MDSR). The health ministry had introduced MDSR in 2016, when the sector was at its lowest ebb. The civil war in Sierra Leone between 1991 and 2002 had left most of its infrastructure in ruins. Millions of US dollars poured in as foreign aid, but the outbreak of Ebola brought the health sector to its knees one more time. When MDSR was introduced, the government made it mandatory to report the death of every woman of child-bearing age. The MDSR report noted that regular supervision of trained healthcare providers was crucial to prevent complications. “Health centres have several shortfalls, but it is important that a patient is among skilled people who can respond in times of emergency and prevent deaths,” said Fatu Fornah, a reproductive health specialist. Fornah heads Reproductive and Maternal Health at the country office of the World Health Organization (WHO), which helped the health ministry institute MDSR. Delay in accessing health facilities is a common factor that leads to maternal deaths. The 2016 MDSR report states that 6 per cent of the maternal deaths that year occurred in transit to a health facility. It’s not without reason that Joseph and Hawa decided against going to a hospital for regular supervision and delivery. Reaching a health centre is a harrowing task in Sierra Leone. In some communities, people have to cover 80-100 km carrying pregnant women in hammocks, on wheelbarrows or commercial motor bikes, to reach the nearest health centre. Many communities in the northern district of Kambia are located near rivers where the mode of transport is canoe. These are expensive and hard to come by in emergencies and at night. “So, many families choose traditional healers for regular supervision and delivery,” said Alusine Komrabai Kamara, who heads Health for All Coalition, a health advocacy network, in Kambia. 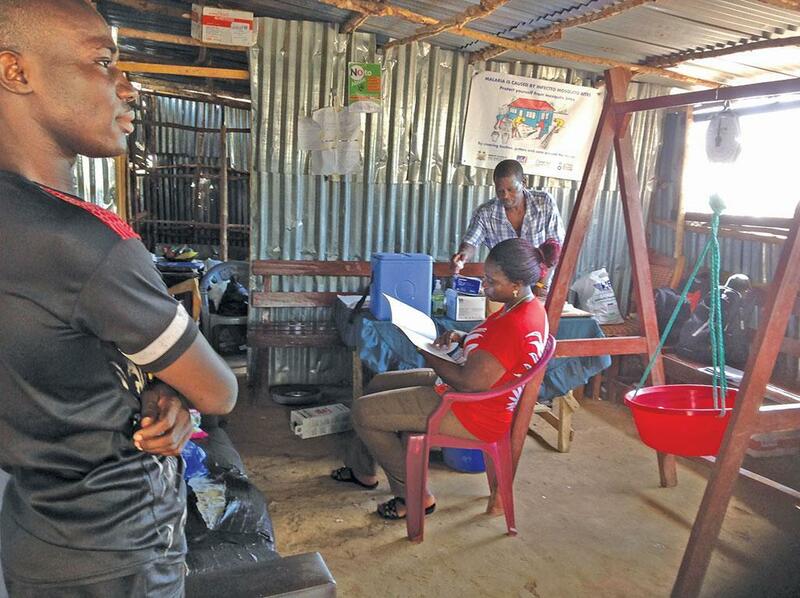 Frightful stories from health centres further prevent people from going there for treatment. Across the country, people are asked to bring along water when they come with pregnant woman for delivery. Health centres in Sierra Leone do not have piped water supply. Blood banks exist, but storage is not possible in the absence of electricity. Banks that have the infrastructure in place provide blood only with the promise that it would be replaced by the patient’s relative or friend. Corrupt officials make these available at exorbitant price, and most patients are unable to afford it. People die in observation rooms even when there is enough blood in the bank. During her first delivery, Hawa needed blood transfusion, but did not have the Le 40,000 (Rs 345) she was asked for a pint of blood. Health centres are extremely short of cash. Thompson Bay, where Joseph lives, is home to some of the city’s poorest residents. It is one of the over a dozen slum communities dotted around Freetown. The clinic here, which is made of corrugated iron sheets, comprises an open area that serves as both the reception and the outpatient ward. A rubber bowl hanging from the roof serves as a makeshift baby weighing scale. Adjacent to the reception desk is an enclosure that serves as the labour room as well as the storage facility. “Deliveries happen during daytime. At night, we go to the house of one of our co-workers who has electricity at home,” said Rebecca Swarray, nurse in-charge at the clinic. Apart from the drugs they receive from the health ministry, everything is procured from personal contributions. A team of five state-registered nurses serves in shifts. The team is aided by volunteers from within the community, she said. Clinics like this constitute the majority of the healthcare facilities across Sierra Leone. Small wonder, only 54 per cent of all the deliveries in the country were done in institutions, states the 2013 Demographic and Health Survey. Sierra Leone is one of the three countries hardest hit by the 2014 Ebola outbreak. Guinea and Liberia were the other two. The epidemic exposed the weakness of the health system. The country with a population of over 5 million, barely had 30 ambulances for the Ebola patients. Many ambulances needed repair and were kept in garages. Ebola hit the health workforce hard. It killed a good 221 health workers, including a dozen specialised doctors. The high attrition rate through emigration combined to result in the country having the lowest doctor-patient ratio in the world. There are 1,190 health centres and less than 200 doctors in Sierra Leone. The most recent Sustainable Development Goal Index sets 44.5 doctors, nurses, and midwives per 10,000. Taking only the higher cadre nurses, Sierra Leone has only 1.4 doctors, nurses and midwives per 10,000 people, states WHO. Ninety per cent of the doctors are based in the western parts, many being in administrative roles. The country has only one known gynaecologist in the public sector. In 2016, the government designed a scheme to ensure health cover to maximum people. Now, three major hospitals are being constructed in the capital Freetown alone. Many hospitals are under construction in the provinces. Last year, the health ministry created a medical post-graduate board to provide specialised training to young doctors. International organisations also provide training to healthcare workers. But there is only one college in the country which produces qualified doctors. But the College of Medicine and Allied Health Sciences does not offer a post-graduate specialist course. Only a few months ago, Julius Maada Bio was campaigning to be president. Improvement in the country’s healthcare system was foremost on his agenda. When Bio became the President, the manifesto became the government’s blueprint. The new government promised to improve the “poor and dysfunctional” state of the public healthcare system and reduce the country’s maternal mortality by increasing investments and savings. Health minister Alpha Wurie promised that the country will seek to meet WHO’s universal health coverage. He said the government will ensure that the annual budgetary allocation meets the country’s international commitment in line with the African Union’s Abuja Declaration. It requires member countries to set aside at least 15 per cent of their budget for health. Despite the promise, the health ministry received only 10 per cent of the budget. In fact, in the last 10 years, Sierra Leone’s allocation to the health sector has fluctuated between 9 per cent and 11 per cent. Civil society members and donor agencies have called upon the government to reconsider the decision. Other than Sierra Leone, South Sudan, Chad, Somalia, Central African Republic, Burundi, and Guinea Bissau have the highest MMR. All these countries have one thing in common—a history of political instability. Yet, with the exception of Sierra Leone, all of them have made commendable progress. In 2008, Sierra Leone recorded 890 maternal deaths per 100,000 population, while South Sudan recorded 2,054. Ten years later, South Sudan reduced its MMR to 789, but MMR in Sierra Leone shot up to 1,360. Now, Sierra Leone needs desperate corrective measures and provide patients a combination of proper healthcare facilities and skilled health workers to ensure universal health coverage. Somalia, in East Africa, is among the least developed nations listed in the 2012 Human Development Index. Although it came out of anarchy and civil war in 1990, its state of health is still poor. The country recently adopted a federal system, but the federal institutions or states did not formulate a good health policy. Worse, Somalia has been facing a continuing drought since 2011, putting the health of vulnerable groups like women and children at risk. Somalia has a high fertility rateÐeach woman has 6.6 children on an average. This is accompanied with high maternal and child mortality. Neonatal deaths, which happen in the first 28 days of life, are the third highest in the world. Most deaths are caused by easily treatable illnesses like pneumonia, diarrhoea and measles. With the low rate of immunisation, the incidence of diarrhoea in children under five has remained at 24 per cent for decades. In 2014, the estimated immunisation coverage for measles and Diphtheria Pertussis Tetanus (DPT3) was well under 50 per cent. Pneumonia, which can easily be treated with antibiotics, kills more than two children every hour in Somalia. A 2017 report by non-profit Save the Children says 24 per cent of all under-five mortality is due to pneumonia. Undernutrition is, however, the underlying cause of most deaths. More than 300,000 children under the age of five are acutely malnourished. According to the Somali Media for Environment, Science, Health and Agriculture (SOMESHA) and Monitoring and Evaluation Department for Social Affairs (MEDSA), children suffering from acute malnutrition are nine times more likely to die of disease than a well-nourished child. Somalia's drought has led to severe malnutrition in children. More than 30 per cent of the under-five children are stunted. Over the last 15 years, the number of stunted children has increased from 50.4 million to 58.5 million. Up to half of all deaths in the under-fives are associated with under-nutrition. These have to be treated with life-saving therapeutic food at nutrition centres run across Somalia by the United Nations agencies, NGOs and INGOs. Three quarters of the children below two years are anaemic as their mothers know little about nutrition. Less than one in 10 infants are exclusively breastfed up to the age of six months. They get tea or sugar water with breast, formula or animal milk. Only one in 10 children at the age of one gets the correct combination of breast milk and solid foods recommended by WHO/UNICEF. With poor health facilities in the country, it seems impossible that Somalia will reach the Sustainable Development Goal 3 (SDG3) target for child health (see `SDG: A far fetched dream',). SDG3 sets 2030 as the year for Somalia to end preventable deaths of newborns and children under five years of age, and reduce NMR to at least 12 deaths per 1,000 live births and under-five mortality to 25 deaths per 1,000 live births. Somalia is completely off track to reach the Millennium Development Goals (MDGs). Abdiqani Sheikh Omar Hassan, former Director General of the Ministry of Health and founder of the Somali Young Doctors Association, says, "During my tenure, the aim was to achieve universal health coverage, and provide safe and affordable medicines and vaccines to all. But due to lack of funds, prolonged conflict and civil insecurity, Somalia will not be able to implement the SDGs." The federal Ministry of Health has formulated a plan to reduce maternal and child mortalities through improved access to essential health services, and prevention and control of communicable and non-communicable diseases. But, Hassan warns, the plan's implementation depends on the occurrence of droughts, cooperation between the states health ministry officials, nation's security and political stability. (This article was first published in the 1-15th December issue of Down To Earth under the headline 'Mothers' struggle'. It is part of a series on healthcare in Africa. See links below).